Sometime it becomes difficult to choose the best pressure washer that fulfills all your requirements. When you have a medium budget and you want to use it properly in buying the convenient pressure washer you have to depend on an electric pressure washer. 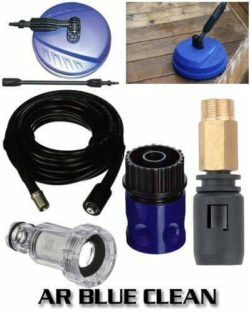 Keeping your budget in mind you can buy AR Blue Clean AR390SS Cold Water Electric Pressure Washer which is powerful and durable at the same time. It provides 2000 PSI of water pressure to serve you effectively in your residential use. The company is pretty reliable in terms of making pressure washers and it will be a good decision to buy a product from them. It has a long power cord, a long high-pressure hose and two sturdy wheels for the product’s easy movement. The combination of water pressure and 1.4 GPM of water flow can wash away almost all the dirt from your home. To wash your car, motorcycle, boat, driveway and many more things this device can be your best friend. The device is featured with a 1.5 Amp/ 1.6 HP heavy duty universal motor that has 15% larger motor brushes for premium performance. The motor creates 200 PSI of water pressure. A high-quality AR pump provides 1.4 GPM of water flow for a complete clean. The pump has metal inlet and good discharge tubes which are more durable than plastic. AR Blue Clean AR390SS Cold Water Electric Pressure Washer has Total Stop System (TSS) for saving your energy and making your motor life longer. It has 35 foot GFCI power cord and 30-foot long high-pressure hose to give you a good stretch from your house. The functional, pressurized hose reel easily doesn’t let the hose be left untidy. Its wonderful spray wand lets you hold the gun comfortably. The wand is provided with zinc steel lance and quick-coupler nozzle fittings. There are four types of quick connect nozzles which include 0, 25 degrees, soap, and rotary/turbo nozzles. The device has a large integrated 48 oz detergent tank for an easy detergent application. When assembled the size of the machine becomes 16.4-inch depth, 15.2-inch height, and 37.8-inch width. The weight of the machine is 33.56 pounds and the two wheels make it easier to carry it from one place to another. Heavy Duty Universal Motor: When you think of water pressure the motor comes forth that actually produces the water pressure. 2000 PSI of water pressure is actually more than enough for using in your residence. With this kind of pressure, you can do almost all the light, medium and some heavy duty cleaning. The pump provides you 1.4 GPM of water pressure that you can easily control by using different nozzles. Total Stop System (TSS): Because of this smart feature the motor automatically stops working when you are not using the trigger. It will save your lot of energy and will prolong your pump’s durability. 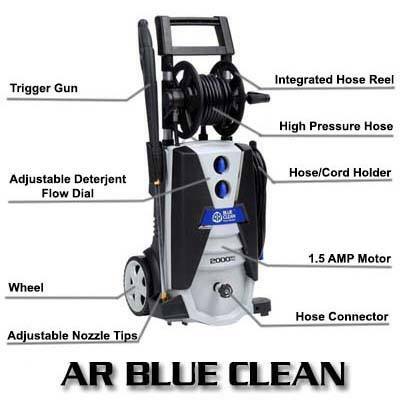 AR Blue Clean AR390SS Cold Water Electric Pressure Washer gives you this facility to save your energy and relax. Convenient Detergent Tank: It is a big hassle to carry a bucket of detergent with you while you are busy in washing. The device’s 48 oz integrated detergent helps you in this case by carrying your detergent without any difficulty. Pro-style Spray Gun: Most of the times it becomes difficult or uneasy to hold the gun of a pressure washer and it affects your cleaning. The spray gun that is provided with the device is very easy and comfortable to hold and use. You can easily connect the hose with the spray wand without any experts help. Warranty: You are going to get one year of bumper to bumper warranty to assure your safe investment. If there is any manufacturing defect the Company will take the responsibility to cure it or change the parts. Some of the users complained that the hose is a little stiff to roll on the reel in a perfect way. Though most of the owners don’t support this problem. Another complaint about this device is that some users found the direction for assembling the product is difficult to understand. If you are a professional then it is a minor issue. If you are a new user then you can take help from someone else at the first time. When you plan to invest your valuable money you should be careful about investing it in the right place. AR Blue Clean AR390SS Cold Water Electric Pressure Washer is such a product that you don’t have to regret after buying it. It has power, durability, style and it is very easy and convenient to use. The power cord is featured with GFCI protection facility. You will stay out of danger on a wet ground. If you are planning to buy the best pressure washers in the market this device is one of your best options. Click to Buy it Now on Amazon with FREE Shipment!